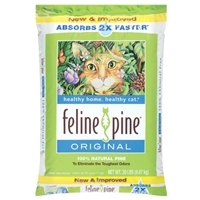 Feline Pine is the #1 natural alternative to clay litter. With no odor, no dust and no tracking you'll only wish you had found it sooner! Feline Pine defines the word ""simplicity."" Liquid waste is COMPLETELY absorbed, at which time the strong ammonia odor is naturally neutralized. As the odorless pellets dry, they break down into sawdust and settle to the bottom of the litter box, leaving fresh pine pellets on top! Simply scoop and flush solids daily and your litter box will remain clean and dry! When it is finally time to clean the box, you can use Feline Pine as landscape mulch, as all Nature's Earth products are biodegradable and recyclable!